Ramos said that the utility is “completely content” with the work Whitefish is doing. “The doubts that have been raised about Whitefish, from my point of view, are completely unfounded,” he added, saying that concerns about Whitefish were probably spread by jealous competitors. Whitefish officials have said that the company’s expertise in mountainous areas makes it well suited for the work and that it jumped at the chance when other firms were hesitating over concerns about payment. The company acknowledges it had only two full-time employees when Maria struck but says its business model calls for ramping up rapidly by hiring workers on short-term contracts. Pay Your Trump Bribes Here! The official location and counter to buy Trump off. 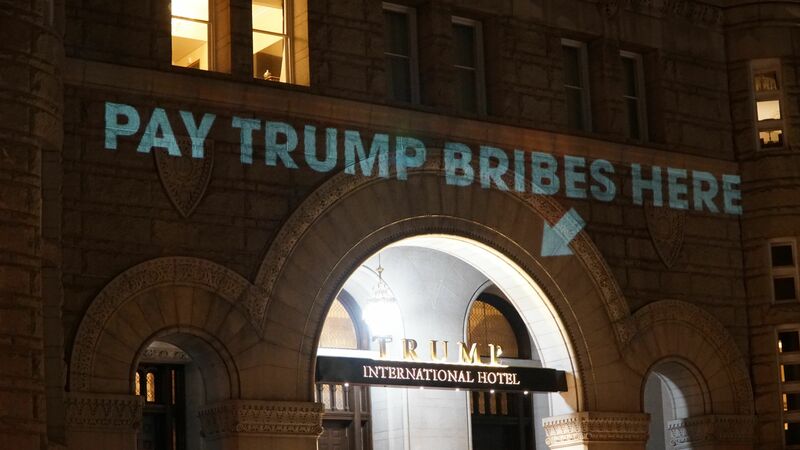 The most corrupt government in the world not in a 3rd world country.A wholly owned subsidiary of Putin, Inc.
A multimedia artist caused a commotion in Washington, D.C., late Monday when he projected a series of images on Trump International Hotel that skewered the president over accusations about his business ties with foreign governments. 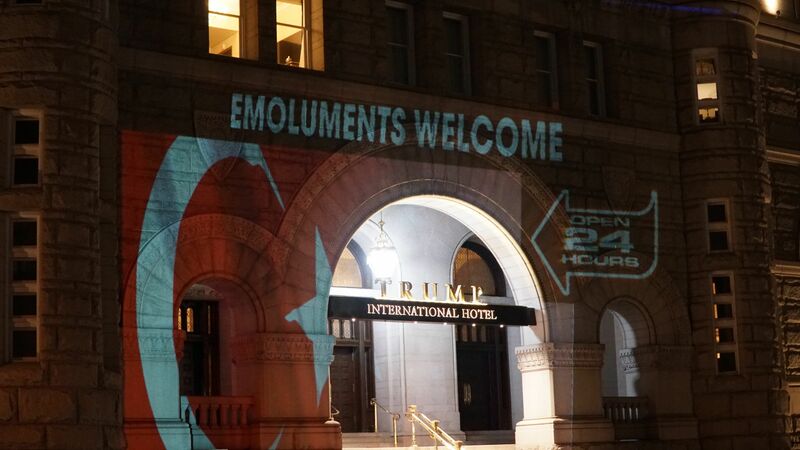 Robin Bell, a Washington-based artist known for his political projections, said the work was meant to highlight benefits Donald Trump continues to reap since his ascension to the presidency, including revenue generated at his D.C. hotel. The artwork, which went up around 10 p.m. local time, quickly spread on Twitter before it was shut down by hotel security. Staff reached at Trump International Hotel declined to comment about the messages. Legal experts have said they aren’t certain if Trump has actually violated the so-called Emoluments Clause of the Constitution, which prohibits those holding office from accepting gifts from foreign governments. 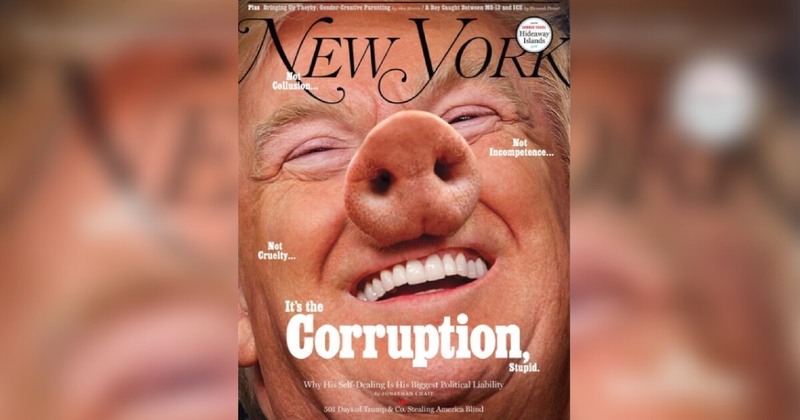 However, a watchdog group filed a federal lawsuit earlier this year accusing Trump of doing just that through his vast empire of property holdings, which he still owns while they’re being managed by his two adult sons. The president’s lawyers have contended that paying for a hotel room is not a gift. Monday’s artwork cycled through three projections: One read, “Pay Trump bribes here”; another, “Emoluments welcome” on top of the flags of Russia, Turkey, China and Saudi Arabia; and a third showed the Emoluments Clause in its entirety. Bell said his work is a simple act of resistance in the nation’s capital, where, he noted, it’s “sad to see the old post office being used” as a Trump business. The hotel has become the go-to destination for foreign diplomats. “Maybe in the history books it’ll show that we were not for this,” he said.